Researchers from the University of Brussels have developed soft robots that are capable of healing themselves. The robots are made of very soft, flexible, deformable materials called “polymers.” There is a growing demand for soft robots due to their ability to perform tasks in dynamic and uncertain environments without the need for extensive control systems. Their inherent softness and flexibility make them ideal for interacting with humans and handling soft materials such as fruits and vegetables. However, their inherent softness and flexibility also make them vulnerable to all kinds of sharp objects and overpressure that are present in the uncontrolled and unpredictable environment. 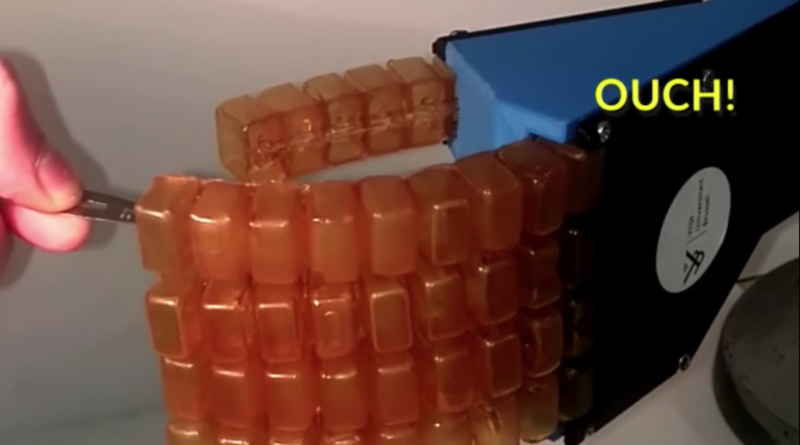 In the paper “Self-healing soft pneumatic robots” published in the Science Robotics journal, researchers from the University of Brussels demonstrated how their soft robots were able to heal themselves. The researchers were able to show that their soft robots’ – made specifically of Diels-Alder polymers – self-healing ability can be activated by means of mild heating. The researchers showed that a millimeter-long cut all the way through made with a scalpel blade in Diels-Alder polymers sheets can be successfully healed by heating the parts to 80°C for 40 min and slowly cooling down to 25°C. After 24 hours at 25°C, the researchers found, the initial properties are almost entirely recovered.